"Sugar skulls, and beer, and bloody mary bar!" 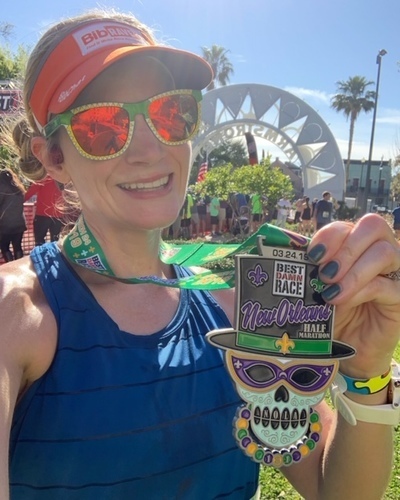 This was my first time running Best Damn Race New Orleans since they changed the course. I was a little apprehensive about running over the Wisner bridge but in the end I really liked the course. The roads were good, some nice scenery along Esplanade Ave and City Park and the bridge, while tough, wasn't terrible - especially since that's the only "hill" on the course. The pre and post race setups were great. Tons of porta-potties with lots of extra toilet paper and ways to wash your hands. The post race beer and bloody mary bar was a huge plus too. 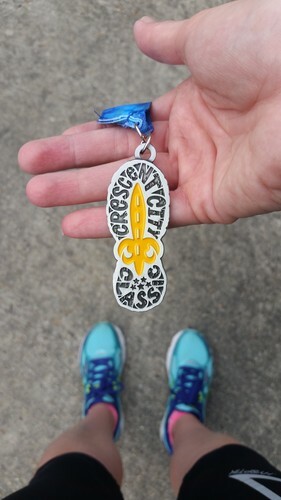 And of course, the race medal is gorgeous. I would definitely run this one again. "I LOVE running up to the battleship every year!" There are so many great things about this race. The distance is fun (how often do you get to run a 12k!?) and fast. I love that it's on Veteran's Day weekend. The race prints special bibs out for Veterans so you can pick them out and thank them for their service. Seeing the battleship off in the distance and running up into the park is always motivating and inspiring! - US Veterans receive a special colored bib to celebrate their service. - GREAT medal and race shirt. Always one of my favorites of the year. - Running into the Battleship Memorial Park is so cool, and you get handed a little American Flag (usually by the Boy Scouts) as you enter the park. - Tons of donuts and coffee post race. - The lines can be long getting to the bus to take you back to the start where you parked/hotel. - The course was re-routed this year so the last quarter mile was through some soft grass (due to other events on the same day). Hoping next year it's back on the pavement through the park. - It can be difficult for loved ones to get into the park to park and meet you at the finish. "A gem of a race just north of New Orleans"
This is a hometown race for me so I'm a little partial to it. 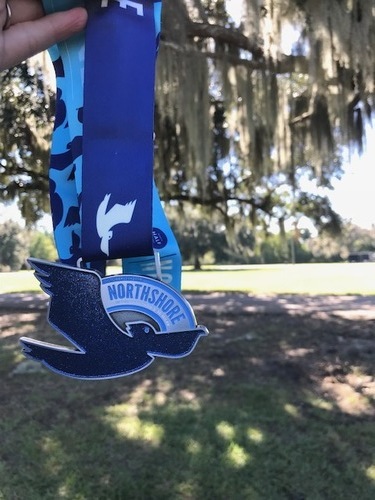 It's run through scenic Mandeville, LA along the Lake Ponchartrain lakefront and starts and finishes at the Fountainebleau State Park. - Easy to get to the race start with ample parking. - Lots of bathrooms and several actual working, indoor bathrooms at the state park. - A portion of the course is run on a converted rails to trails that can get a little narrow and has a pitch. "Fun 5k with a TON of great swag and prizes." This is a fun New Orleans 5k along the lakefront. We brought the whole family out for this one to enjoy the miles, food, and fun. This race is so well done by RUNNOTC. There's a half mile for the kids and they even pulled out extra medals from last year to give to the kids so they got a medal too. That was a HUGE deal to my two boys and it's these little touches that keep us coming back. - Super simple packet pickup the day of the race. - Very nice out and back course along the lakefront. - Abundant parking at the race start. - THAT medal! It's a crab AND a bottle opener. And this is just for a 5k! LOVE. - Great, super soft race shirt with a fun design. I actually wear this shirt often. - So much great food after. I had beer, and snow-ball popsicles, and jambalaya and there was plenty more other stuff too. Amazing line up of vendors. - THE POST RACE PRIZES. Seriously. SO MANY DOOR PRIZES!! My son walked away with $300 last year. This year we won some free boxing classes. It really is fun to see if your number gets drawn. - So. Many. Bridges. ....ha. This is not your typical flat as a pancake New Orleans race. Several overpasses/bridges along the race route made for some tough running with the jogging stroller. But I really loved the challenge! Nice to mix things up. I would definitely recommend this race if you're in the area or local. It's a good one! "New race finish area! " This race has quickly become one of my favorite races of the spring. It's an Easter tradition in New Orleans. The race always happens on the Saturday before Easter. With a huge field of participants (I think over 17,000) from runners to walkers to strollers, it can be both a highly competitive race or a fun party in the back. Some people pull coolers full of adult drinks the whole way! There's even a fun costume competition with prizes. - GREAT expo. They always bring in some really great vendors for the expo and it's huge for a 10k. I like that a majority of the vendors are local too. 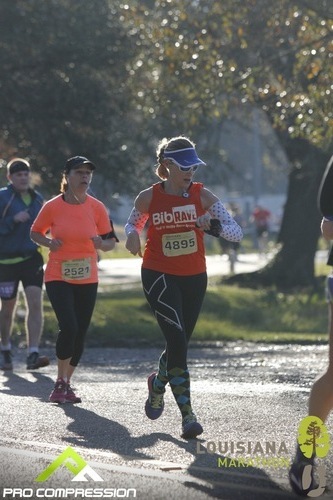 - Flat, scenic course through downtown New Orleans, the French Quarter, then up Esplanade to finish at City Park. - The addition of timed corrals has greatly improved this race for those who truly want to RUN it. They were policing the corrals pretty heavily this year so make sure you sign up for the corral you want to be in. I moved up to a faster corral this year and it made a ton of difference. MUCH less weaving and winding around walkers. - I really liked the t-shirt design this year. 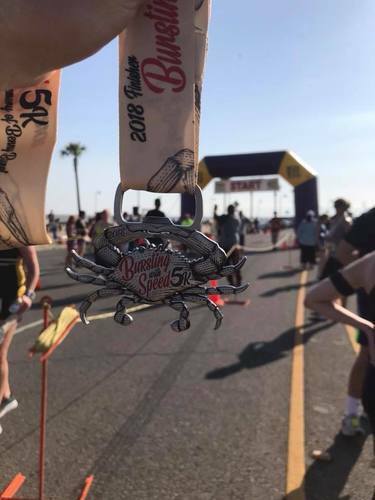 - Medals for all finishers! - The first 500 people to finish (based on chip time) in each gender receives a commemorative poster (worth $50)! I was only 4 seconds away from a poster this year!!! WHAAA!!! - Aid stations every mile were manned but some great, enthusiastic volunteers. - Fun family/kid zone in the finish festival with a climbing wall and blow up obstacles and slides. - The buses were really quick taking people from the finish to the start in the morning. Very little wait time. - It's spring in New Orleans. The weather was gorgeous! - New race finish area eliminates the old blind finish. I liked it! - The lines for the porta potties at the start were really, really, really long. I ended up just having to hold it and run really fast to the finish to go. Ha! - There was some confusion by the people policing the corrals on how to get to the "D" corral. They told us to walk through the "E" corral to get to "D". It took us several minutes of weaving through a mass of people when all the while all we had to do was walk around to the side of the street to easily enter there. - The roads can be a little rough - but that's New Orleans. You learn to look down as you run. I truly love this race. It is always one of my favorites and one of the funnest races I do each year. I'll keep coming back for more each year! Next year that poster is MINE!